Kia Ora! We are the NZ Representatives for the World Federation of the Deaf Youth Section’s Youth Camp in Australia this year! We are all going to Melbourne, Australia next month to be part of this once in a lifetime opportunity. We thought it would be a good idea to introduce ourselves so that the Deaf community know who the NZ representatives attending the next WFDYS camp are. Hello my name is Zoe, this is my sign name. I am 15 years old, from Wellington and am Deaf. Soon, in April I am going to Melbourne, Australia for the Deaf Youth Camp that WFDYS is hosting, where participants of countries around the world will attend. I am looking forward to going to Melbourne because it means I get to meet new people, learn from the presentations there, and learn how to become a leader for my country. Thank you. Hello my name is Meghan, this is my sign name. I am 16 years old and live in Auckland, West Auckland to be exact! Out of the five of us, I am one of the participants/camper attending the World Federation of the Deaf Youth Section Camp (WFDYS) in Philips Island, Melbourne, Australia. I am going next month, April 2017. I am excited to learn more about the four themes which are: Knowledge, Passion, Courage, and Belonging. I am excited because it means I can come back to my own country and share this learning with my community. Thank you for watching. Hello my name is Tanesha Sleeman, I am 17 years old and currently live in Christchurch as a boarding student at van Asch Deaf Education Centre. I am originally from Levin. I am excited to attend the WFDYS youth camp as a participant because this is a new experience for me and I’m sure my world will open up with the new friends and connections I make at the camp. I am looking forward to sharing this experience when I return. Thank you. Hello my name is Rahui, this is my sign name. I am 14 years old, nearly 15 in March! On 10 – 17th April, I will be flying to Australia for the WFDYS Youth Camp. I am excited to attend as I have never been overseas before, and this camp will be my first overseas interaction experience. I am mostly excited about meeting new people, learning about their culture, their goals in their countries, the kind of food they eat, and the language they use. I’m sure it will be very interesting as it is my first time. The camp is for one week, so when I return I will be able to share my new experience to my family and friends. Thank you. Hello! My name is Rachel Berry, this is my sign name. I am 21 years old and live in Christchurch. I will be attending the WFDYS Youth Camp in Philips Island, Australia as a Leader representative of New Zealand. I am really excited to attend, why? I attended WFDYS youth camp in Turkey, in 2015 as a participant, and now I am attending as a Leader, so it will be a different but an exciting experience. I am looking forward to seeing what the experience will be like for our NZ participants as two of them have never been overseas before. I am also looking forward to seeing them put into action their new learnings as they bloom into NZ’s new leaders for their generation. At the camp, we will video and record our time there every day so that when we return to NZ we can share this fantastic once in a lifetime opportunity with our community. Thank you for watching! See you soon. Join for only $30 a year. Established in 1993, New Zealand Sign Language Teachers Association (Inc) is a national professional organisation for New Zealand Sign Language Teachers and interested people who support the mission and goals of our organisation. Your membership fee will assist with the administration expenses of NZSLTA i.e. Postage, photocopy, stationary, etc. with the aim of keeping you informed about current NZSL teaching issues. NZSLTA supports your professionalism by providing professional development workshops when possible, information on NZSL teaching courses and other related courses. NZSLTA provides national weekend workshops or conferences every year or two to support your professionalism of being a good NZSL teacher to share ideas in teaching methods and experiences. NZSLTA may invite experienced lecturers form New Zealand and overseas to give you a better opportunity to learn from a different angle. By joining NZSLTA, you may be able to share information on NZSL teaching and to network amongst NZSLTA members. From the networking, you may be given guidance, advice, information and support from other NZSLTA members, nationally or locally, on aspects of NZSL teaching, with their experiences of teaching NZSL. You will be keep informed on the progress of NZSLTA: updated news on NZSLTA members nationwide and up to date information on events, workshops, courses, general meetings, funding, and any new development of NZSL resources. Newsletters are produced about 4 times a year. NSLTA works with other Deaf-related organisations with a common goal to raise the professionalism and promotion of NZSLTA member, the status of NZSL and the support from other organisations. To increase the fluency of your NZSL students, NZSLTA provides NZSL Silent Weekend Camps, giving NZSL students an opportunity of using NZSL in the real world interaction with Deaf tutors and Deaf volunteers. The camp activities may include a mixture of language and outdoor activities as well as drama or storytelling activities. And more…. Check out the site now. With your membership support, the Executive Committee meet regularly to plan strategic plans for NZSLTA to improve the benefits for NZSLTA members e.g. organising national workshops, developing more NZSL resources, camps for NZSL students etc. The more members we have, the better the service we are able to provide and promote our language. On Friday there will be entertainment by local schools, Kohanga Reo and Early Childhood Centres with a free concert featuring Troy Kingi, Ruia Aprehama, Fat 32 and Ngati Hine’s Favourite son Te Huaki Punaki. 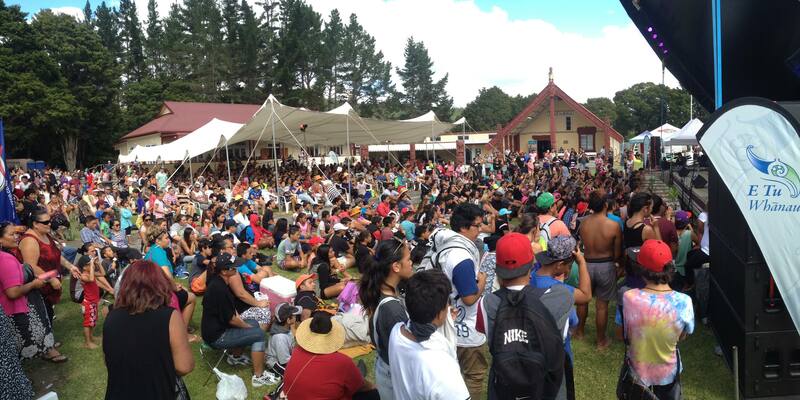 Saturday will have more of the same but better with senior Kapahaka, Bands Hip Hop, whakapapa sessions and Tautohetohe. 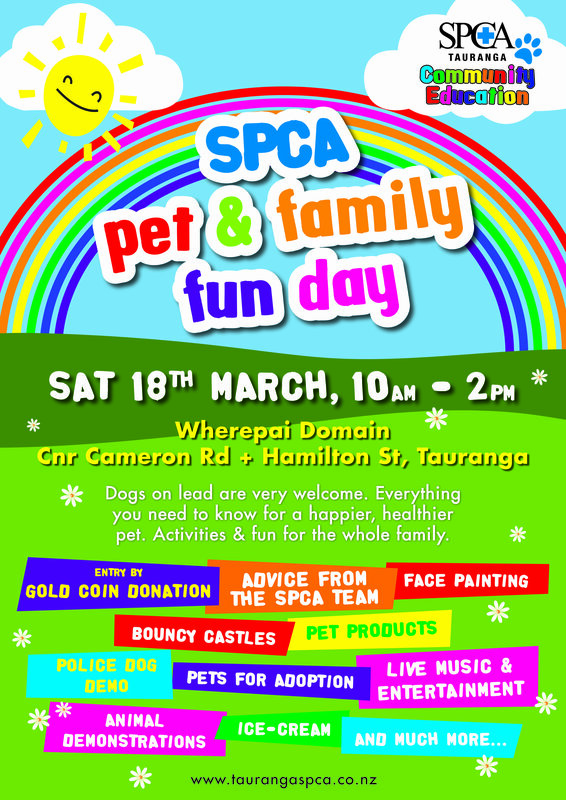 There is also a number of other activities including an art exhibition in the Whare Tupuna, Tumatauenga, educational stalls, a wearable arts parade and more! Come and explore the local marine reserve on a single or double kayak at high tide. Learn about the marine life that lives there and get professional kayaking tuition. Fun for ages 7 and up. Kayaks and life jackets provided, you can also register your own vessel (paddle board or kayak). Join in for some fun in the sun at Okahu Bay Reserve! Auckland Deaf Society and Auckland Parents of Deaf Children are combining to host a Summer Picnic. This is for families, and kids as well as Big Kids (Adults) who want to participate in the ADS traditional games – Tug-of-War. 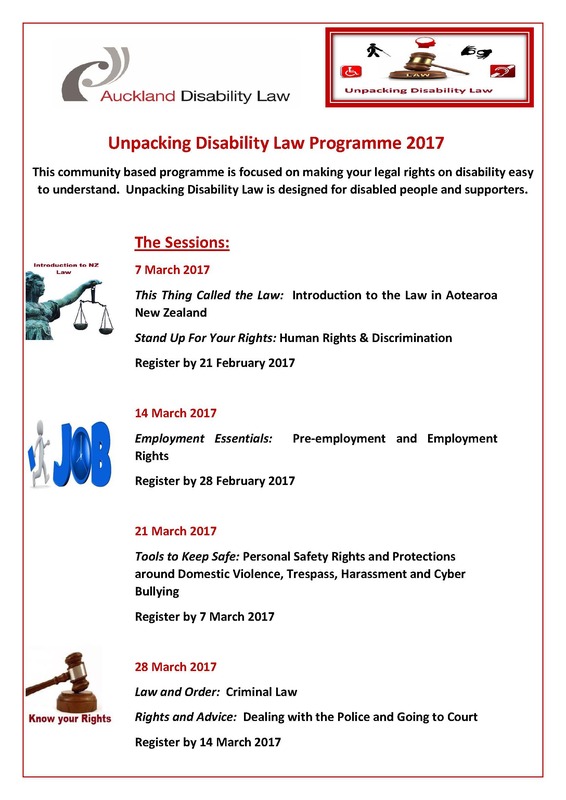 Registrations for our new Unpacking Disability Law Programme is open. This free community based programme is focused on making your legal rights on disability easy to understand. If you require an NZSL interpreter, please advise them two weeks in advance of your session. Unpacking Disability Law is designed for disabled people and supporters. You can come to the entire programme or you can choose which sessions interest you. Each week the sessions are 10am to 1pm. To register send your name, email address, contact phone number, date and session(s) name you are interested. You are welcome to bring a support person, family member or agency with you. Please let them know if you have any other access needs. This is an Art production that also involved song dance poetry and kids performing in a show. It gives you a taste of how kids can gain confidence, self-esteem, learn how to perform on production art. 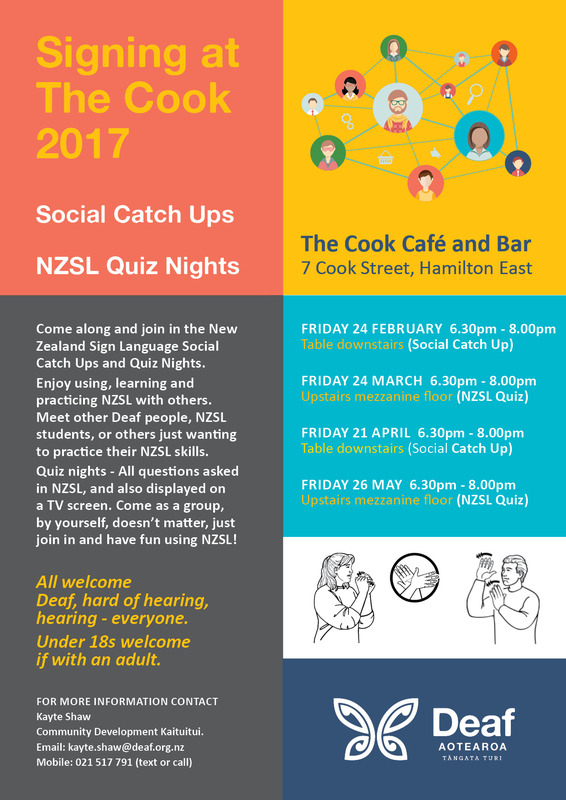 Come and join in a NZSL quiz night. All questions asked in New Zealand Sign Language (NZSL) and also displayed on a TV screen. Prizes to win! All welcome! Deaf, hearing, Hard of Hearing, people learning NZSL, Everyone! Come as a group, or by yourself, doesn't matter, just join in and have fun! Under 18 welcome if with an adult. For more information contact Kayte Shaw - Community Development Kaituitui. Come dressed as your favourite character or superhero! Register your Teddy for a gold coin donation from 10am, receive a certificate, and be put in the draw to win spot prizes. 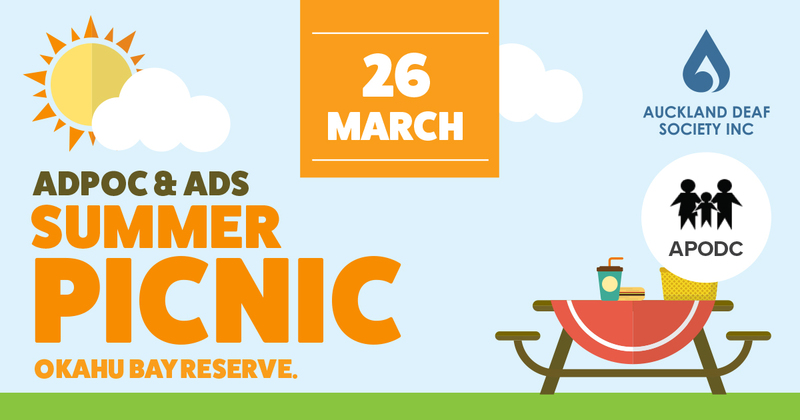 Bring along your picnic lunch, shade, rug and your Mum & Dad, caregivers, Whanau, family and friends. The AutoFest is back in 2017 and is bigger & better offering more entertainment for the entire family. - Sound off and lots more (keep checking Facebook event page). This fun day out for families and amateur cyclists will include cycling and cyclocross races for all age groups, a Small Wheels area for under-5's, entertainment, spot prizes and an exciting display by the amazing Freestyle Lifestyle BMX team. Brought to you by Rotary Cambridge and with all proceeds going to CureKids. Dogs are very welcome on a lead. A great day for the whole family to enjoy the fun and activities. Chadwick Road will be closed from Greerton Road to Cameron Road for the display of vintage cars and vehicles. Classic motorcycles will be on display in the school grounds. They are expecting 18 caravans dating back to the 1960’s. Mike King is our guest speaker and there will be stalls, BBQ and activities to mark the occasion. Come out and support the Retreat and find out more about what they are offering the community. The trucks leaves Centennial Drive at 9.00am and will go along St Aubyn Street to Molesworth Street, right into Hobson Street and left into Devon Street East and left again to Nobs Line where the trucks will be displayed. All profits to Taranaki Rescue Helicopter Trust. Children's entertainment - face painting, airbrush tattoos, bouncy castle, water walkers and Big Rig rides, Live band, tug-of-war competition and much more. Prize giving is at 3.00pm. Cost: $10 spectator, free for 12 and under with paying adult. The fastest street cars and hot rods have been invited to battle it out at the historic Bell Block home of street drags. Proudly brought to you by Gunners Incorporated, this event is held as a community fundraiser for Conductive Education Taranaki - helping disabled kids reach their potential. Bring the kids for a tramp/hike/bushwalk around Lake Mangamahoe with the New Plymouth Tramping Club. This is an opportunity to have a leisurely walk around the lake and find out about the Take A Kid tramping program and/or about the club. Bring snacks, drink and your lunch and wear good walking shoes. If you need more information or want to RSVP, please contact Ka Puna. There were about 10 Deaf people who attended and they all provided the Napier Disability Advisory Group (working with Napier City Council) with feedback and shared their experiences. The information that was provided will contribute to how the council can support people with a disability. The office will be closed on Thursday 30th March and will reopen on Friday 31st March. If you have any enquiries, please contact Kat or Lee. There have now been changes to the community computer bookings. It used to be next to the visitors register at the front desk, but it has now moved. 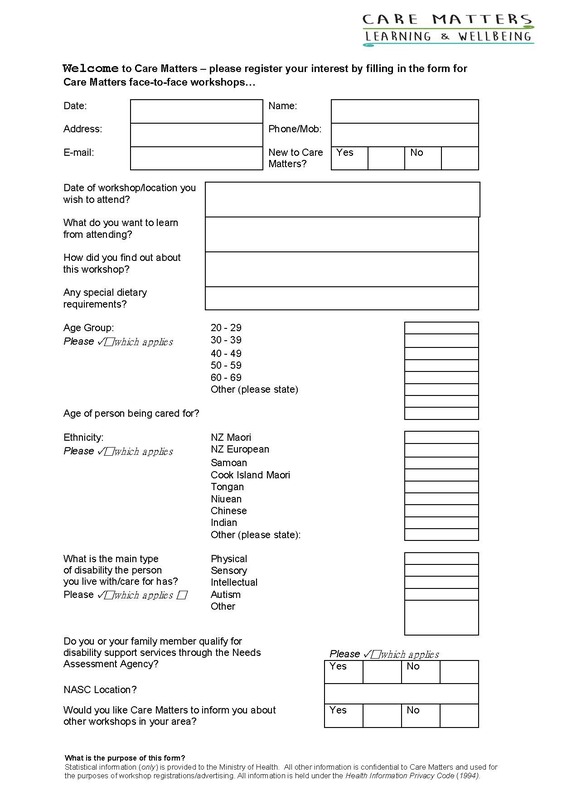 In future if you wish to book a time to use the deaf community computer, please contact any staff to book, they will refer to an electronic booking system to ensure whether it is free or not. You can contact staff either by text or email. There has been a notification from Palmerston North to report any young persons or juveniles committing crimes around the city. Did you know that there is a NZSL Series available on Channel North OnDemand that is presented by two Deaf Community Members Alana Best and Mita Moses from Northland? It is for Deaf and hearing people. There are numerous episodes including interview with local Northland person or business and teaches some NZSL signs to help people communicate with Deaf people they know and those they may meet or work with in the future. There are a few different episodes relating to emergency, technology, sports, employment, Deaf Aotearoa, Deaf Parenting, Deaf Education and more…..so you want to know more, do check it out on https://www.channelnorth.co.nz/onDemand// as it is available in NZSL and captioned. 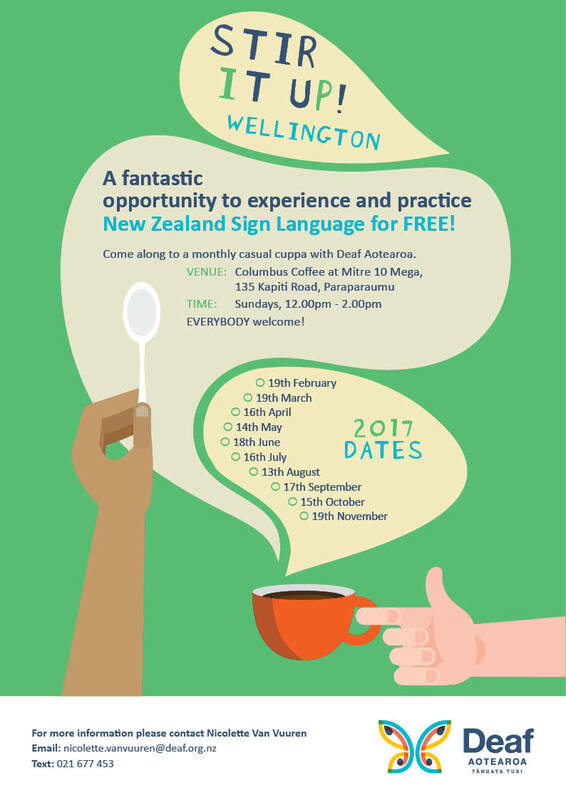 A fantastic opportunity to experience and practise New Zealand Sign Language for FREE! 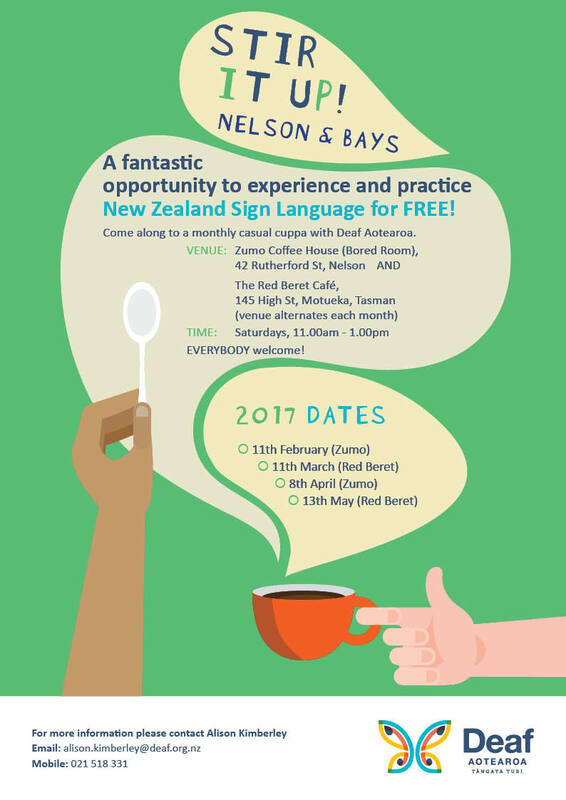 Come along to a monthly casual cuppa with Deaf Aotearoa. For more information, please contact Nicolette Van Vuuren. Join in for a drink or two! For more information please email below. 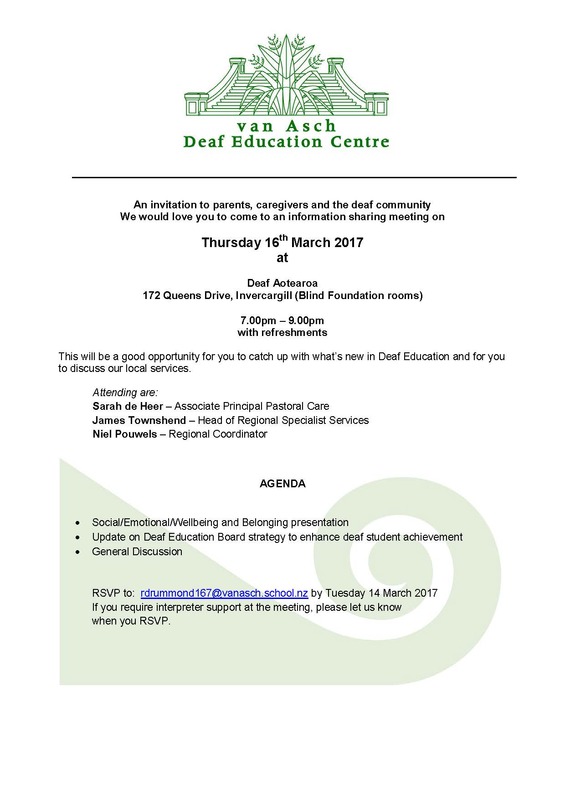 Nelson Deaf Aotearoa office will be closed on Wednesday 15th March because staff will be attending a seminar. The Office will open again on Thursday 16th March at 9.00am. 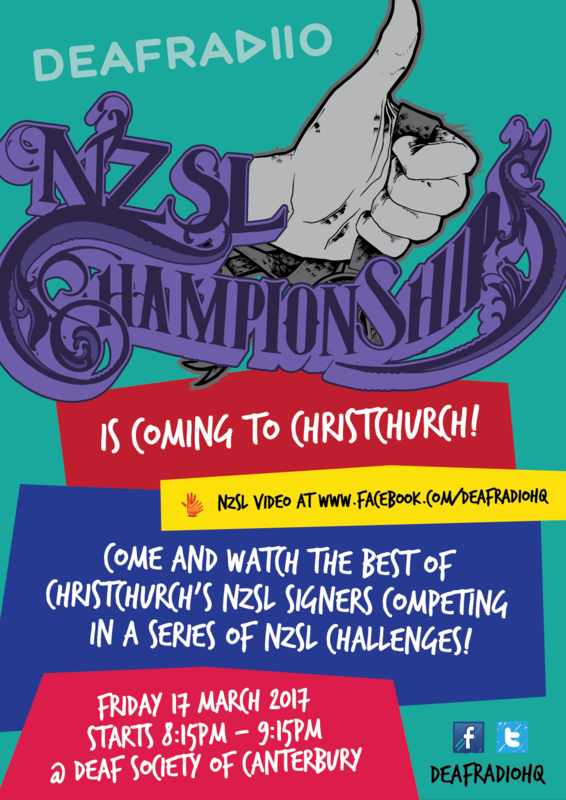 Come and watch the best of Christchurch’s NZSL signers competing in a series of NZSL challenges! Costs: Pay $30 on arrival, first come, first served. Keen to get involved with 10 pin bowling? Food is provided, so have a great night out with some tasty snacks. Please contact Lara at with your full name by 17th March at 11am. Please also confirm your dietary needs if any (gluten free, or vegetarian). Costs: Gold coin each to help fundraise for the Arts Centre rebuild. There will be two captioned movies on – one for the kids and one for adults. There are food stalls outside the entrance. Limited spaces available for health and safety so please get there early to save a spot. Get in quick for a large supply of good books to get you through those long, chilly nights. Bring a bag and get ready to rummage! The office will be closed for Otago Anniversary Day on Monday 20th March. Reopens on Tuesday 21st March. Come and catch up with other families and bring food to share at your potluck! If you haven’t met them before, this is a great opportunity to meet the community. If you can lend a hand for cleanup that will be much appreciated. Please email Steve Walton if you would like to help. Please leave give your mobile number so you can receive notifications about the working bee. Last year they managed to get half the roof painted with the amazing people that came to help, now it needs to be completed, as well as the guttering. Part of having the use of the hall is to maintain it, but it can’t be done without your help! IF you can lend some of your time this would be much appreciated. Postponement date Sunday 12th March. Where: Queens Park, Gala Street, Invercargill, Southland. The ICC Surf to City is a fun, participation based event, offering a 12km, 6km, or 3km distances that can be run, walked or Cycled. The Course makes its way from Oreti Beach, past some exciting on- course entertainment and finishes at Queens Park. There is also the AMI kids in the City event held entirely within Queens Park. They enter on the day and receive a free drink bottle at the finish line. 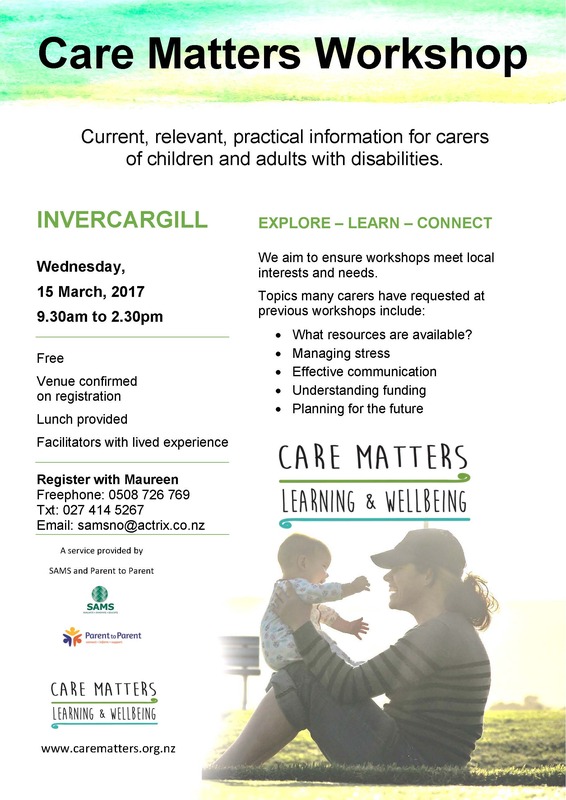 A workshop on the current relevant practical information for carers of children and adults with disabilities. To register, please contact Maureen. Where: Blind Foundation, 172 Queens Drive, Invercargill. An opportunity to catch up with what’s new in Deaf Education and discuss local services.